A DS3 line (also known as a T3) is an ultra high-speed connection capable of transmitting data at rates up to 45 Mbps. A DS3 signal carries 28 T1 signals, each operating at a rate of 1.544 Mbps. 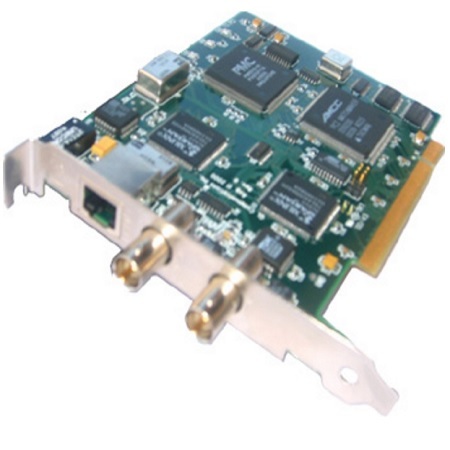 The GL's UltraT3 Cards (PCI) plug into PC expansion slots and provide digital T3 input/output for analyzing, testing, simulating, and monitoring T3 signals. A single T1/E1 input and output is provided to insert and receive T1 (or E1) signals into the T3 stream. The cards provide the capability of generating 28 DS1 or (21 E1) signals within the DS3 output. The T3 Card when used in conjunction with Ultra T1 Card in same PC provides a complete DS3, DS1, and DS0 testing solutions. The DS3 Receiver non-intrusively monitors a DS3 bit stream, and presents comprehensive diagnostics of PCM impairments and alarm messages in real-time. The input is compatible with the signal found at the DSX-3 panel, as well as at the output of a DS3 source. The user selected DS1 (or E1) is dropped or inserted at the T1/E1 output interface provided on the T3 Card. The DS3 Transmitter can multiplex an externally supplied DS1 (or E1) bit stream into the DS3 signal. Designed to stress test M13 multiplexers and 3/1 Digital Cross Connect System.